Just 35 miles north of Iditarod headquarters and the sled dog capital of the world, Talkeetna is at the heart of the home training ground for mushers and their racing teams. Tours begin at the Kahiltna Bistro across from the shuttle transfer to Talkeetna. 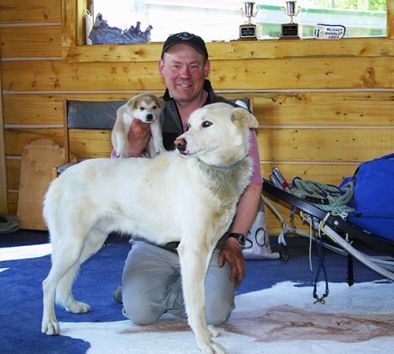 You’ll visit the rustic home of World Champion sprint musher, Kathleen Holden and Top 20 Iditarod musher Jerry Sousa. Visit an authentic Alaskan log cabin, meet the dogs, see a demonstration of sled harnessing and mushing preparation. Learn about the winter training program to get these dogs ready for the Iditarod Trail Sled Dog Race held annually in March. You then experience the thrill of the training program when a team is hooked up and you ride local trails. You will also get a chance to hold and play with the future champions, the puppies (if available). Minimum age is 5. Children under 12 must be accompanied by a parent or guardian. Depending on the snow level, our local tour operator may opt to operate tour with a motorized ATV. Tour will operate rain or shine. Tour operates subject to meeting a minimum number of participants. Tour takes place in Talkeetna.